1990 Mazda Miata Roadster has a triple plated chrome roll bar, definitely a very cool looking and semi-functional addition. There is also a black custom front dash cover protecting the dash which is still in great condition. The seats and carpet are very good too, very minimal wear for the year. The clear front lens are cool. The front and rear glass is new. A pioneer CD stereo with door and seat head rest speakers makes a great sound system. 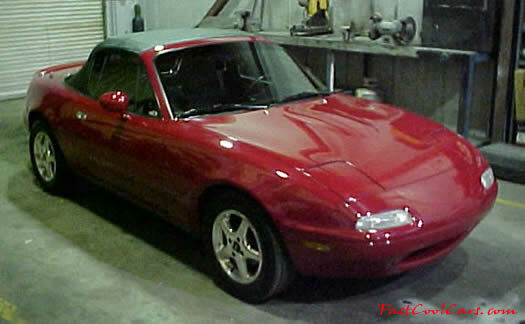 The polished aluminum wheels are a nice look compared to the original 1990 Mazda wheels. They are mounted on a new set of Michelin's. This is one handling car, it has 4 wheel double wish bone independent suspension and 4 wheel disc brakes that stop very well, Red calipers to match the car. Factory rear spoiler. Aftermarket front mesh grill insert with driving lights. Dual sport side mirrors. Mazda sun visor block offs to replace the deleted sun visors. An optional new top cover for when the top is down.